There’s been several science headlines recently stating that “Scientists Claim Universe Shouldn’t Exist.” Which I suppose means we should all just vanish in a puff of logic, or (derp) the scientists have said something stupid again. Needless to say, “scientists” have said no such thing, and what has been said is an interesting venture into cutting-edge theoretical physics. The popular press articles are based on a paper published in Physical Review Letters, which looks at possible connections between the Higgs field (of Higgs boson fame) and early inflation possibly observed by BICEP2. The authors took the mass of the Higgs boson as determined by the LHC (which is a measure of the strength of the Higgs field) and the value of inflation as measured by BICEP2 (which is a measure of the strength of inflation in the early universe). 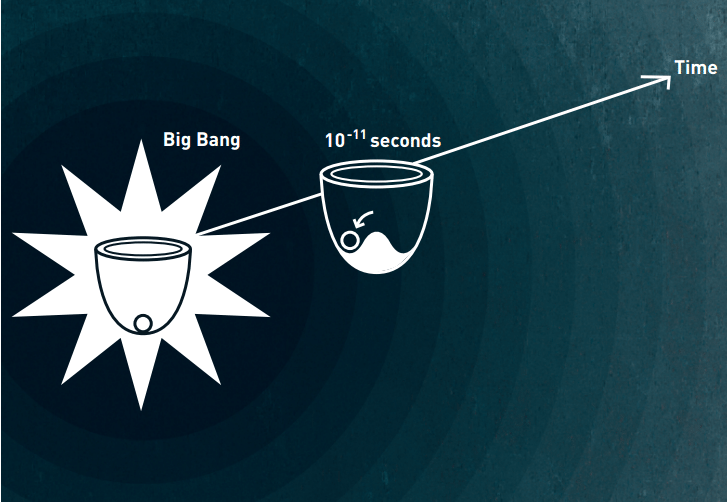 They then analyzed what would happen according to our current understanding of early cosmology. What they found is that given these two values, early cosmic inflation could create quantum fluctuations strong enough to cause the Higgs field to collapse. This would effectively collapse the universe, hence the headlines. A possible collapse of the Higgs field is something we’ve known since its discovery. It stems from the fact that quantum systems don’t always have to settle in their most stable configuration. They can instead find themselves in a locally stable state (known as a metastable state). We see this, for example, with electrons in an atom. The stable state of an electron in an atom is its lowest possible energy level, but an electron can be in a higher energy level for a while. Eventually it can drop to a lower energy level, which releases a photon. This effect is why we see line spectra in stars and interstellar clouds. Given the masses of the Higgs boson and the top quark, the Higgs field seems to be in a metastable state. If the top were more massive, it would be unstable, and if the Higgs were more massive, it would be stable. This fact is sometimes expressed by the statement that the universe could collapse into a new quantum state at any moment, but that’s a whole other topic. This new paper simply calculates that given current values it would seem the universe should have collapsed during inflation. This tells us there is something wrong with our model, and there are several possibilities. One is that the measurements are off somehow. The BICEP2 results (if valid) give a value for inflation that is stronger than expected. If the inflationary period was weaker, then that could be a solution. Given the weakness of the BICEP2 result, it is quite likely that the inflation value is wrong. Another option is that inflation is simply wrong, but that isn’t seen as very likely. The authors look at another possibility, that somehow the Higgs field and inflation are connected. This idea has been examined before, but this new paper demonstrates that such a connection could resolve the problem of early collapse. So what this paper actually does is point in the direction of new physics. Higgs driven inflation could resolve some real problems in the model, and that gives us motivation to explore things further. Yes, that was a point I got lost as well. I understand the ‘at any moment’ due to the meta stability but I can’t picture what this new quantum state would look like.Would that basically mean that our standard model with all those quarks and electrons would go down the drain?